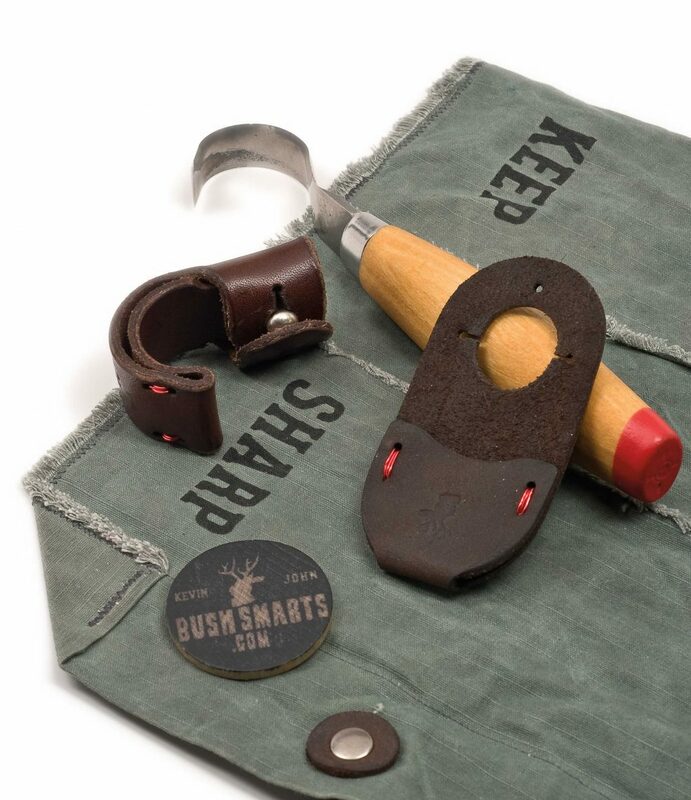 BushSmarts’ new carving tools for the outdoorsman include a hooked knife and custom sheath, a thumb guard, and a roll-up pouch. Each piece is sold separately. The knife is beveled on both sides and at the point of the hook, making it perfect for carving spoons and bowls. It could use sharpening, though, which is tricky with a hooked blade. I love the sheath, which is made from thick, oiled leather stitched with wire. A buckle holds it closed, totally encasing the hooked knife. Other BushSmarts carving tools include an axe, a bush knife, and a pocket knife. The thumb guard is more expensive than many of the suede and elastic guards carvers often use, but it will last you a lifetime. The guard is made from the same thick, oiled leather and wire as the sheath. It fits securely over any size or shape of thumb. I’ve never felt as safe carving toward my thumb as I did with this tool. I even wear it when making paring-type cuts using a micromotor and carbide-point bit. The waterproof roll-up pouch is pricey but works well to keep your tools in one place if you throw it into a backpack. These tools are available separately from www.BushSmarts.com. The knife and sheath are $52, the thumb guard is $20, and the pouch is $25.